If you're interested in buying a second-hand car, ensure you make an excellent choice to prevent headaches for years. With the help of car journalist Wilmer Müller, we've compiled the ultimate guide on how to smartly buy a used car. "Be realistic about what you can afford and stick to your budget. Consider any repairs you may have to do and the increase in fuel if it's very different to what you are currently driving. Think of your lifestyle and what you might need in terms of interior space, finishes etc. If you are doing a trade-in, find out what your car's trade-in value is and never accept the first price. Different dealers offer different incentives like cash back. The ideal car to buy will be a demo model of 6 months to 1 year old, with mileage of 10 000 -15 000km." "Draw up a shortlist of desired cars. Don't set your heart on only one model - consider and test drive at least three options." "If you are interested in a certain model of car, read up about it in car magazines and online forums. Chat to friends with similar cars. Visit websites like Autotrader.co.za and Carfind.co.za to get an idea of car prices at certain ages and with different mileage." "Ask around what a typical service will cost if the car is no longer under a motor plan. Consider your location and whether you have easy access to service centres. For example, if you buy certain models you might only find their parts in major cities, which may be hundreds of kilometres from where you live." "If you want to buy a car from a dealer, make sure it's an established one - not uncle Jannie's Motors down the road who may have only been in business for two years. With any future issues, you'll have a better chance to have your car fixed at an established dealership. You will know that the car hasn't been stolen and that you'll have an up-to-date service history. I wouldn't buy a car from friends and family but if you do, make sure the car has been well maintained over the years." "Never just buy the first car you like. Remember, everything is negotiable. If buying from a car dealer, negotiate to get them to include all on-the-road costs (registration etc)." "If you are buying a car privately, your initial contact will most likely be a phone call or email. Be sure to ask lots of questions so that you don't waste your time with a visit. Why are they selling the car? What was the car primarily used for? Where was it parked during the day? And at night? Do they have kids? What kind of daily commute did they do? Have they done many long road trips? When last were the tyres replaced? Any recent repairs? Any serious accidents (fender benders are okay/normal)? If buying from a dealer, don't worry about asking a dumb question. Ask them why the mileage is high or why the interior looks shabby. They are the experts and they will give you sound advice." "Play detective: if you are buying privately, ask where a seller works, Google them and see what you can find. Once you are ready to meet, be sure to take someone with you, even if you are a man. Tell someone where you are going. A safe place is outside a police station, and ask the person to bring along their ID. Never meet at your house, rather your or their place of work." "There is nothing wrong with buying a car voetstoots but just make sure that you have all relevant information. Check that the service manual is up to date. Phone the last service centre used to see whether the service actually happened. Although the Consumer Protection Act dictates that sellers must disclose all defects, in practice it can be a real pain to get your money back. It will take a lot of time and money in the case of a dispute." "There are various AA Dekra tests that can be done on a vehicle. The Roadworthy Test is a legal requirement and must be conducted every time a vehicle changes ownership, ensuring that it meets the safety standards defined by the SABS. For extra piece of mind, you could also have the Multi-point Check, Technical Inspection or Safety Check performed. For a few hundred rand you could be saving yourself thousands in the future." 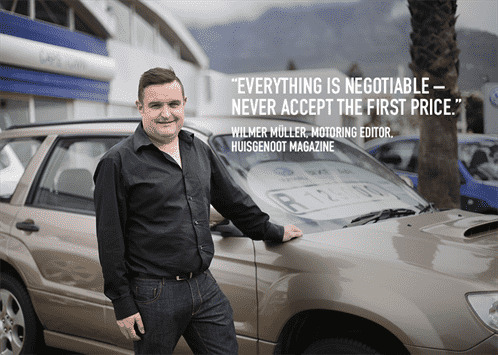 Wilmer Müller is the motoring editor and social media manager for Huisgenoot magazine, and the former editor of Wheels24. Visit our car advice page for more useful tips. loading ... We are processing your request, thank you for your patience.